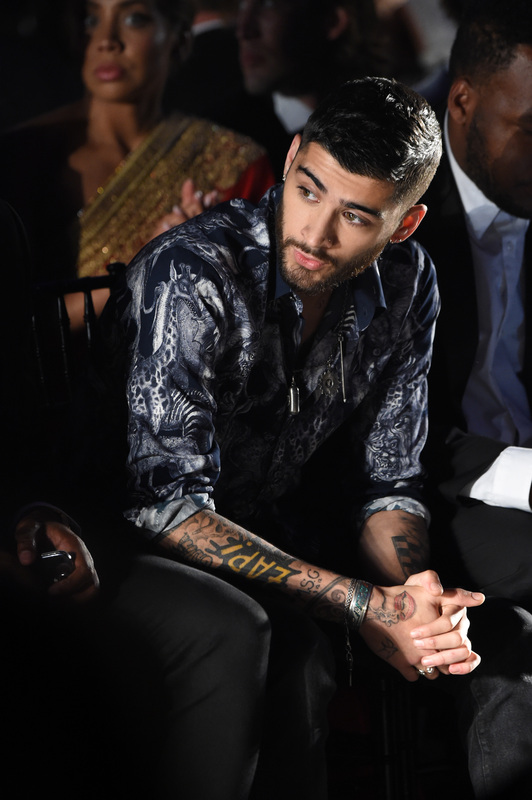 Zayn Malik is known for his tattoos, but the former One Direction member's new ink is out of this world. Zayn Malik got a light-up lightsaber tattoo on his middle finger on Friday. The 23-year-old singer hasn't yet posted his own image of the tat, but New York tattoo artist Jon Boy posted pictures of Zayn and his new ink to Instagram. One of the pics shows both the normal tattoo and the lit up version; a special blacklight ink creates the effect. The other Insta showed Zayn and friends posing with Boy. Diehard Zquad members might have already been aware that Malik was a major Star Wars fan. He recently honored the Star Wars holiday May the 4th with a tweet. He was also a fan of this mashup with the Force Awakens trailer, tweeting "okay I low key love this." Back in 2012, Malik's former band One Direction even filmed the music video for "Kiss You" on the George Lucas stage where much of Star Wars was filmed. While it was pretty clear he was a Star Wars fan, a permanent body ornament is a whole new level of devotion, though Zayn doesn't seem to hesitate when it comes to getting tattoos. Zayn's got everything from skulls to his album title to a giant tattoo of his ex-girlfriend's face to a cartoon "zap!" on his body. His Mind of Mine album art even featured little kid Malik with his grown-up tattoos. The light-saber is Malik's most high-tech tat so far. Blacklight tattoos have been around for years, and they're especially appealing for those interested in discretion. While Malik's lightsaber is outlined in regular ink, many blacklight tattoos appear invisible during the day and only show up under a blacklight. It's perfect for those whose workplaces might frown on tattoos, but who want to show off their ink when going out. There are some risks to getting these tattoos, so you should pick your artist carefully. It definitely seems like Jon Boy knows what he's doing; he's also given tattoos to Kendall Jenner and Hailee Baldwin, and he specializes in small, minimalist designs. I'm sure plenty of people will be asking Boy to repeat Malik's lightsaber in the days to come. Malik is a walking advertisement... if he decides to flip you off, that is.